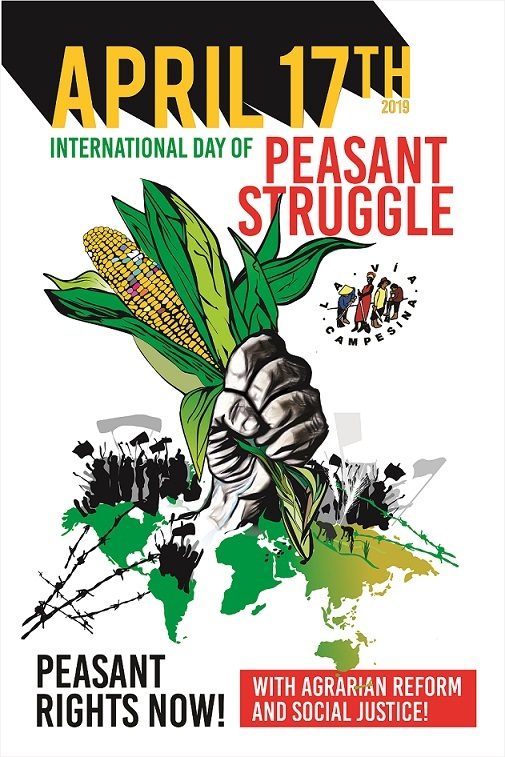 (Harare, April 4, 2019) This April 17th – the International Day of Peasant Struggle – with our living memory and rebellion inherited from our 19 landless comrades murdered with impunity in the Eldorado do Carajás Massacre in Brazil, we call upon our members, friends and allies to come together with strong actions worldwide, affirming that the only way to obtain Peasant Rights is with Agrarian Reform and Social Justice. On 17 December 2018, the 73rd Session of the General Assembly of the United Nations in New York adopted the United Nations Declaration on the Rights of Peasants and Other People Working in Rural Areas. The Declaration is an international legal instrument. As Via Campesina we must mobilize for its real implementation in our territories, and this implies that the State guarantees access to the land, the protection of seeds facing commercialization, putting a stop to evictions and deaths, as well as creating measures against agrochemicals; social justice means that those who feed the world live in dignified conditions and in peace in the countryside, without being prosecuted for defending their rights and territories. In this current context of extractivism and the alarming rate at which lands are forcefully grabbed from our people, the urgency of Agrarian Reform proves strategic. Particularly so, since the neoliberal offensive in the whole world is accompanied by the loss of the rights of the working class and consequently of the peasantry. This is why this April 17th we are mobilizing and calling for struggle and resistance in all territories. We also invite other organized social movements, unions, universities, media who are friends of the peasant movements and governments that prioritize the welfare of its people to join us in the worldwide actions of solidarity. The rights of peasants cannot be substituted by public policies based on the interest of the global market and agribusiness. We denounce this model that not only marginalizes our peasant communities but also appropriates our rights, common goods and lives, in the name of productivity and for the development of the capitalist system in the countryside. So, we make a call to lift our fists in unity, in the country and in the cities for Peasant Rights, Food Sovereignty and Agroecology, globalizing the struggle and the hope of the people facing this model of death. This #17April participate in the multiple actions organized worldwide, organize actions in the territories in the form of protests, discussion forums, seminars, farmers markets, film screenings. Use any of these ways of expressing to demand the implementation of Peasant Rights with Agrarian Reform and Social Justice. During this day of Global Action, we say that an urgent global Agrarian Reform guarantees Peasant Rights, and we denounce the concentration of land into the hands of a few that we are witnessing at a global scale.